Devi Ever, on top of everything else she has done, has been kind enough to sponsor “Oh Goodie!” and my blog since we’ve re-launched. I can scarcely describe how much her kindness and support has meant to me. So I recommend giving back. 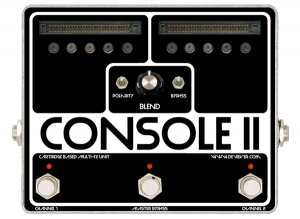 Devi has launched a new Kickstarter campaign to fund the construction of her new pedal, the Console II. A video game themed pedal, it allows you to swap out different effect “cartridges” and blend them to your liking. It’s an incredibly cool idea and concept, and if you can I recommend supporting it. Click the link below to donate now!